THIS BEER was made for the cask. Brawny black, 9% ABV, and liberally dosed with bitter chestnut honey from northern Italy’s Alpine foothills, Bracia blends seven malts and five hops in a best-guess interpretation of an Iron Age strong dark ale. The malt bill is a robust parade of Maris Otter, Brown, Munich, Dark Crystal, Black, Chocolate, Peated and Roasted Barley, while hops are comprised of Target, Pioneer, Hallertau Northern Brewer and Sorachi Ace. This last, being derived from Japan, is hardly a traditional choice for this kind of brew, but it’s parentage of Saaz and Brewer’s Gold certainly cleave more closely to classic European flavors–spicy, earthy, some light floral and lemony citric notes, and a fairly clean bitterness. Admittedly, not much of that hop melange comes forward in the glass–rather an alluring and potently dense blend of grape, syrup, rounded coffee, a slight daub of sweet peat, dark chocolate (not quite bitter cocoa), amaretto, and other nutty derivations. Grape is truly one of this beer’s calling cards, especially on the nose, and it’s more prominent from the bottle. But that quintuplet of hops does come through sufficiently to back up the full body, stake out some balancing earth and slightly woody bitterness in the midpalate, and prevent this beer from becoming too heady and sweet. Indeed, it’s altogether deviously easy to drink, showing limited alcohol heat, a long but not gummy finish, and just enough crinkle of effervescence to scoot it across the tongue. Truly a prize and a refreshing change of pace from the vanilla/coffee-infused bourbon bombs of imperial stouts that have become de rigeuer for so many American craft brewers looking to stake their claim to winter. Let them make their splash: through millennia, Bracia endures. NOW THIS is an uncommon treat. Already known for their thoughtful sourcing of ingredients and patience (“We have no secrets, but if we were to, one would be time,” says co-founder Jeffrey Stuffings), Jester King’s Encendia is a beer with a particularly laborious history. It’s a fully 11% American wild ale brewed in collaboration with Kristina Bozic of West Lakeview Liquors, who helped Jester King to source the mezcal barrels in which the beer aged for 11 months. That already would have made for a lengthy gestation, but the brewery was forced to wait another full year before releasing in Chicago due to their use of an uncommon Mexican spice, epazote. Evidently the TTB was skeptical of the ingredient, which purportedly has a distinctly tangy and herbal taste, and in large doses can be poisonous and/or hallucinogenic. Hence the holdup. Fortunately, Jester King’s brews are well-suited to cellaring, so by the time the TTB got over their huff (or performed their due diligence, depending on your perspective) the beer’s two-year maturation had become a point of interest instead of a liability. Thus the limited supply of bottles released yesterday at West Lakeview Liquors sold out within hours, pulled straight from the box, bypassing the shelves, and landing in eager hands two at a time. And with good reason, for Encendia is a remarkable specimen. Using a bit of roasted barley, the beer pours a hazy mid-amber, no doubt also taking some color from its time in mezcal barrels. A wide-laced whitish head forms briefly but settles into a thin film fairly quickly. The aroma is not overpowering but still deeply layered, invoking an unmistakably south-of-the-border sweet/spicy interplay of desert fruit, pepper, slightly musty pepper, characteristic Jester King funk, a whiff of musty yeast (really quite clean despite the age, though), and a touch of specialty malt. Jeffrey admits that the finished beer may not even show that much epazote character (as if we laypeople could tell), but certainly the other adjuncts of agave nectar and ancho chile come through readily in the initial flavor, enlivening the lips and the back of the tongue with a prickle that stops short of heat. Speaking of, neither is there much alcohol warmth or boozy slickness, despite the beer’s 11% ABV; presumably its two years to develop have smoothed those edges, leaving it a little creamy from the lactobacillus but still quite dry and tongue-gripping. Sourness is present but not overpowering, and that inevitable wild edge kicks in especially towards the finish in a layered aftertaste, eventually spreading from the center of the embouchure out towards the side and back of the cheeks, filtering in between the pinpoints of spice to leave the palate coated but not saturated. It would have been preferable to try the beer fresh for the sake of comparison, but there’s no sense of lost character in this aged specimen. Nor really even regret that it took so long to come to us. Since after all, time is the secret–isn’t it? THE MARKETING information for König Ludwig’s Weissbier emphasizes that its owners and producers are direct descendants of King Ludwig himself. A card worth playing, given that brewing Weissbier was once the exclusive right of royalty in Bavaria. But today König Ludwig is less recognized than other more ‘pedestrian’ producers, from Ayinger to Weihenstephaner, and frankly falls short of its pedigree. Still, Ludwig’s beer still boast an appealing brightness and clean wheat focus while shunning the sweeter pitfalls of many Weizens outside the top tier. A full finger of white head subsides rather quickly atop a traditionally cloudy yellow-gold body with some continuous bubbling. The bouquet opens with moderate wheat, setting the grain foundation first before building up overtones of fully ripe banana (that low, earthy sweetness instead of bright and fruity). The aroma also has touch of grassiness and minerality, too, which the flavor readily backs up with moderate alkalinity. Dry cereal grains are quite prominent, slightly sweet, with only a touch of smokiness and little in the way of phenolic spice; bitterness is mild, albeit a touch higher than expected, countered by touches of breadiness and yeast that appears in the aftertaste. Carbonation seems moderate at first, not quite bursting upon the tongue, but its pinpoint prickles spike from the midpalate through the finish and leave a centralized impression on the roof of the mouth. Phenols have a limited role in this beer, but its overall presence remains balanced and readily satisfying. 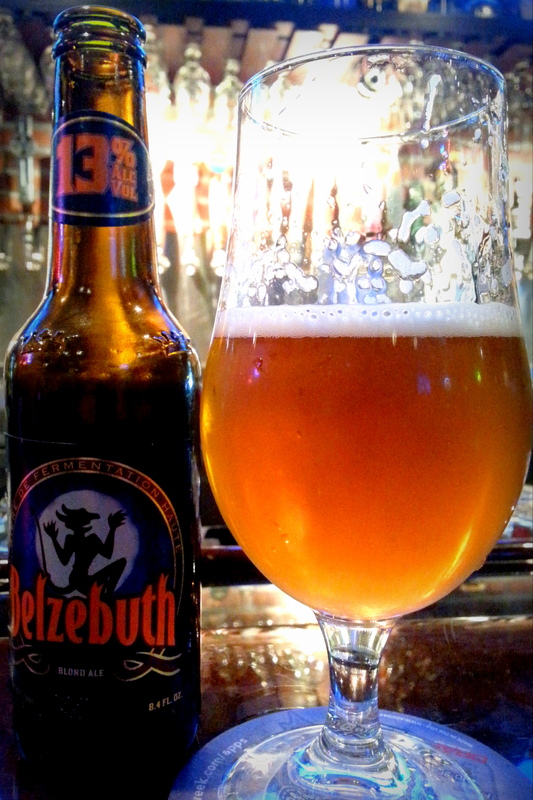 A DEVIOUS NOVELTY, Belzebuth is one of those super-strength beers that wears its 13% ABV proudly on its collar like a laurel won in valorous contest. Yet despite its strength, rather rich golden hue, and finger-plus pile of foamy head, a glass full of Belzebuth is uncannily transparent. This is not necessarily to its detriment, as many ultra-strength beers exhibit symptoms of fermentation stress and unpleasant fusel notes that are unexpectedly absent from Belzebuth, at least in the aroma. Though clearly packing a massive dose of booze by beer standards, its nose is of clear pale grains, a touch of grass, with only a mild solventy undertone. A second pass reveals some Belgian-style yeasty esters emerging in a weirdly indistinct blend of sweeter fruit. Indeed, a sneakily transparent sweetness is the overarching element here—too pure to associate immediately with any fruit or traditional ester, one could almost overlook it at first. But once pointed out it casts a massive shadow over Belzebuth’s unassumingly bright presentation. Still, the beer’s mouthfeel is more balanced than expected: sweet, yes, but not stuffed and chewy like a stout of comparable strength, still rather effervescent, and not entirely slick with alcohol. The sensation of alcohol warmth slides around the tongue but does not burn down the back of the throat (assuming it’s consumed cold enough) and the finish is deceptively clean. This is the kind of naked strength one gets from adjunct brewing, and there’s no doubt that Belzebuth is boosted with dextrose, corn, and the like that contribute to its almost syrupy textures. The preservative E224 is used (assumedly, as its strength varies by market), which is known to kill off yeast and thus may be in part to blame (thank?) for the minimal yeast texture on the beer’s back end, despite being somewhat affiliated with the Belgian brewing tradition. This might leave one perplexed about the point of quaffing a transparent beer with such elevated alcohol if not just to get drunk, and that’s no simple question to answer….The devil’s dance, perchance? ASIDE FROM the exclusivity inherent to its limited production, the bellwether Oude Geuze produced by Armand Debelder of 3 Fonteinen is the rare beer that develops into excellence not just as it warms, but also as it is exposed to oxygen. All beers’ flavors change once introduced to the elements, of course, but few open up and benefit as dramatically as does 3 Fonteinen’s. Fans of more robust, dry, and slatey champagnes will delight in the beer’s razor-edge refinement, uplifting brilliance of aroma and texture, almost bracing acidity, and exquisite, small-bubbled effervescence. It pours with a copious pillow of white head, a slightly hazy color between deep gold and amber, and a light body readily apparent from its agile flow into the glass. Lemon, peach pit, green apple skin, nickel, wildflower honey, and a little Brett yeast tang bloom in the aroma and across the tongue, settling delicately into a lengthy and luxurious finish as it interacts with air. This is also the rare beer to gain confidence and character as one samples more of it, whereas in most cases each subsequent sip is a vain chase after the thrill of the first impression. 3 Fonteinen rather gains in strength, becoming clearer, crisper, more laser-like in its focus and revitalization of the palate. The interplay of robust but refined sensations (lemon tartness against lactic creaminess) also caters marvelously to food, from simple balsamic-tossed salad to paprika-laced goulash. In 2009, a severe mishap in production obliged Armand to depend almost exclusively upon other producers (e.g. Girardin) for several years, but all throughout his blends deservedly retained their distinction and reputation. As of last year 3 Fonteinen is back to making its own beer to scale. Yet one more reason among many to raise a Geuze in recognition. 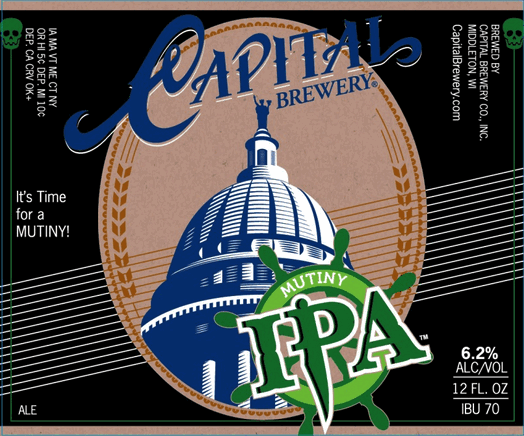 LONG KNOWN FOR stalwart if somewhat staid brews like Supper Club or Wisconsin Amber, Capital Brewing recently revamped its flavor and form with a nautically-themed trio of IPAs: the black Dark Voyage, white Ghost Ship, and Mutiny, ironically the flagship of the three. The trio still flies Capital’s fundamental colors, though, and never intended to boast the firepower necessary to dent Dreadnaught’s sides, for instance. Nonetheless the three represent a new tack for the brewery and one pass is sufficient to show that the changes are more than just cosmetic. Mutiny would have poured a clear amber but for the large yeast flakes that hang in suspension, marring somewhat an appealing presentation. Its aroma is densely packed with marmalade, orange, caramel, a little bread crust, and a fairly complex hop bouquet—earth, pine, some pithy citrus towards the finish, and lesser notes of resin and florals. Cascade is at the core with Simcoe for sprucing up and Warrior and Summit for the bittering backbone, which is considerable at 70 IBUs. The 6.2% ABV has an unexpectedly prominent role, too: nearly hot near the midpalate and simmering up at the roof of the mouth with the elevated carbonation. The body is nearly full (scraping against 6 Plato), but light toast and alcohol crackle keep it relatively agile. Indeed, eventually it develops an almost metallic sharpness that cleaves through the body to reveal the caustic essence of Summit and Warrior, all without leaving throat-scraping residues in the aftertaste. Surprisingly little of the yeast comes through, either, despite their conspicuous presence in the mix—perhaps just a bit of dustiness and hint of astringency. Many strong IPAs these days tout their powerful bitterness but then partially obscure it with elevated ABVs, luscious hop cultivars, and sticky malt bodies. Not so Mutiny. Though neither as brash as its namesake nor mythical enough in stature to earn much respect from the most hop-thirsty buccaneers, Capital’s new flagship still sets an aggressive course that commands attention. 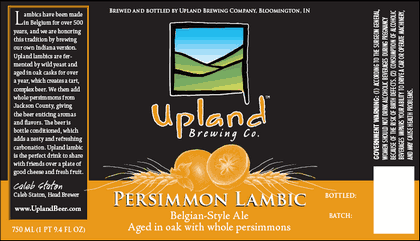 UPLAND’S FRUITED lambics must be among the Midwest’s most unanimously respected beer series. With ingredients familiar (strawberry, cherry) and foreign (kiwi, paw paw), these carefully-crafted and patiently-aged sour ales have a deservedly devoted following. Powerfully fruity yet still traditionally dry and undeniably tart, they make the most of boldly experimental American adjuncts while still incorporating the complex texture and flavors of Belgium’s brewing wilderness. Despite its unusual choice of fruit addition, this Persimmon lambic falls more towards the conservative end of the series’ spectrum. Its aroma is bright, zesty, and moderately sour, showing substantially lemon and slight sour cream notes of lactic acid without revealing very much fruit. Oak character from the barrel-aging aging is subdued, mostly contributing smoothing vanilla in the background. Persimmon does contribute a broadly fruity tang (somewhere between melon, apricot, peach, and citrus), but does not leap out with a single, defining flavor—unlike, for instance, the Blackberry or Kiwi versions. Instead the Persimmon lambic is akin to the still-experimental Paw Paw variety: cagily fruity but still letting the wild yeasts lead the way, drying out the body almost completely and delivering pronounced acidity and strong effervescence that lands lightly upon the tongue and dissipates evenly throughout the mouth, leaving it slightly scoured and refreshed. Altogether it’s less singular a concoction than some of Upland’s other lambics, but one’s hard-pressed to call it much worse. 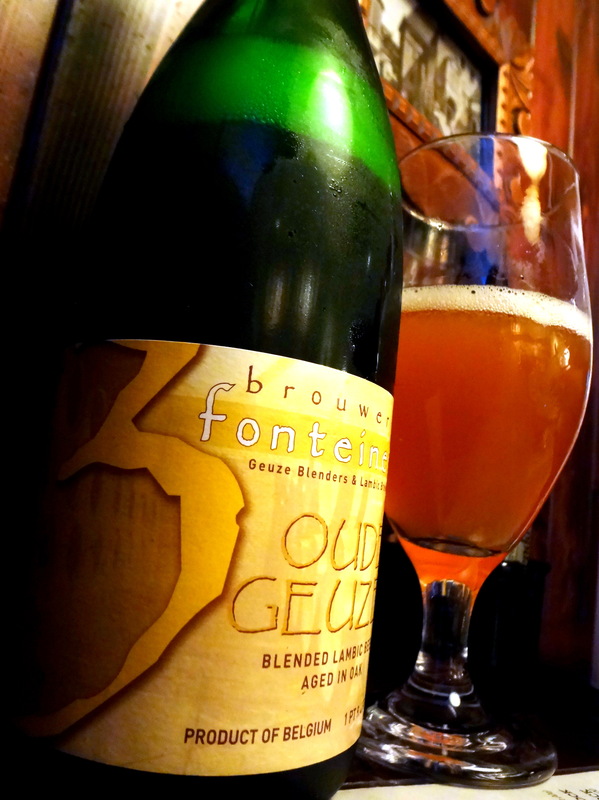 Contrary to expectations, this unconventional adjunct actually resulted in a flavor profile more appealing to fans of traditional lambic, so neatly is it framed alongside the robust tang of Brett and other wild beasts.